Captured by the Germans Soviet BA-10 armored car. 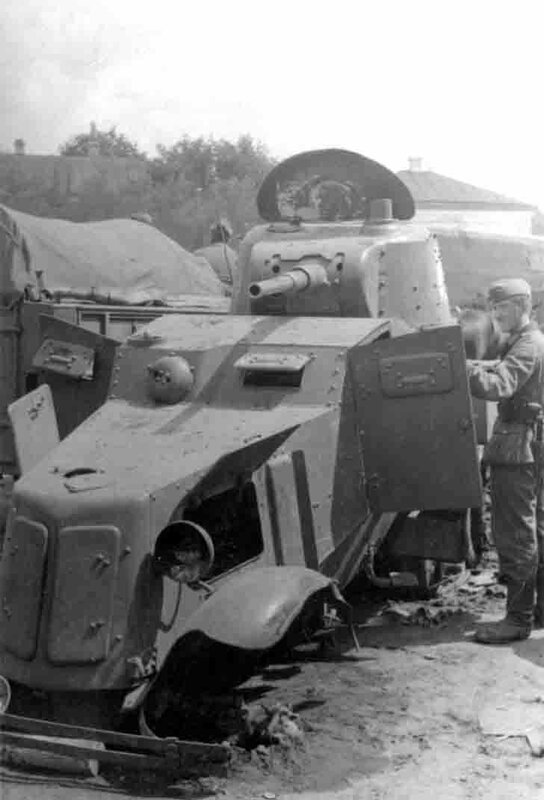 BA-10 Soviet medium armored car was released in 1938. He was protected by anti-bullet armor (body forehead 10-15 mm, the board housing and food – 10 mm, the roof 6 mm, bottom – 4 mm), armed with 45-mm 20K gun and two 7.62mm DT machine guns. The armored car was equipped with 4-cylinder engine “GAZ M-1” output of 50 hp, which allowed the BA-10 to reach a maximum speed of 53 km / h. The total output of the BA-10 amounted to 3311 vehicles. During the fighting, the summer of 1941 the BA-10 medium armored cars were used very actively, often along with the tasks of exploration, communication and outposts are often used to attack together with the infantry and support their units on the battlefield, leading to unreasonably high losses . However, with proper use, thanks to a 45-mm gun, Soviet armored vehicles could successfully fight against German light tanks. So, June 22, 1941 in the result of well-organized ambush squad of 6 armored cars BA-10 under the command of Lieutenant Tank Regiment of the 5th Armored Division of the 3rd Mechanized Corps Surovtsev hit and killed 6 of the German light tanks and a large number of motorcycles. But, despite some cases of successful use in the first two months of the war most of the BA-10 armored cars from the border districts was lost. The troops of the BA-10 armored cars were used until 1944, and in some units until the end of the war.